THE Cherbourg cricket team have played in the B-grade grand final for the past two seasons but are yet to claim season honours. They want this to change in 2019 and captain of the team Barry Fisher Senior said the team will give it their all this season for another shot at the title. "We will just keep working and see how we go through the season,” he said. The team started their season on the right note on Saturday with a win over the Nanango Scorpions in Nanango. The home team won the toss, elected to bat and were all out for 94 runs. Stephen Kirkland was the top scorer for Nanango with 22 runs followed by B. Greenslade on 20 and Simon Marrow scored 18 runs. Lyndon Hopkins led Cherbourg's bowling attack with four wickets for 23 runs after six overs and on maiden over. Cherbourg scored 105 runs in 15 overs to win the game with Tom Langton the top contributor with 47 runs and B Greenslade claimed four wickets for Nanango. Nanango have another young side taking the field this season and the team is passionate about helping young players develop into stronger cricketers. "We do what we can at training and games to help them,” Nanango player Stephen Kirkwood said. In the other game of the day defending champions the Blackbutt Timbertowners scored a dominant win over the Kingaroy Services. 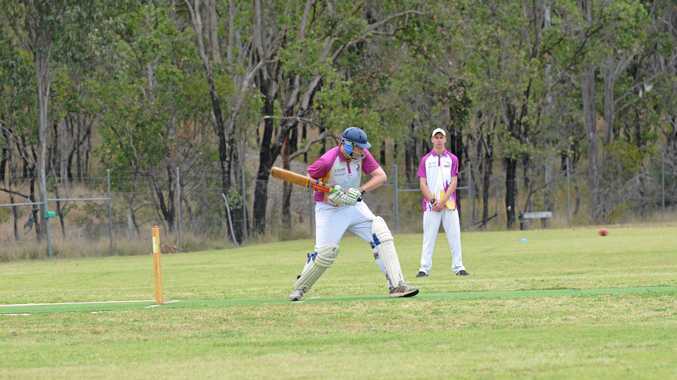 Keiran Harvey had a strong start to the season with the bat scoring 121runs and Blackbutt team mate Mitchell Olzard added 93 runs to the scoreboard. The Services were unable to better Blackbutt's 386 runs and were all out with seven for 65 runs. The game between the Murgon Diggers and Kallindale Warriors to be played in Kingaroy was washed out and Wondai forfeited to Kumbia.